Continuing the success of the style, Unstoppable, She's Unstoppable maintains the same lightweight features and stylish versatility , bridging the gap between performance and style. 8 Base fully rimmed O Matter. Created to flatter a medium face shape. Comfort and performance of Three-Point Fit that holds lenses in precise optical alignment. Durability and all-day comfort of lightweight, stress-resistant O Matter frame material. Patented Unobtainium nose and stem pads prevent glasses from slipping out of place. Comfort and performance of Three-Point Fit that holds lenses in precise optical alignment. 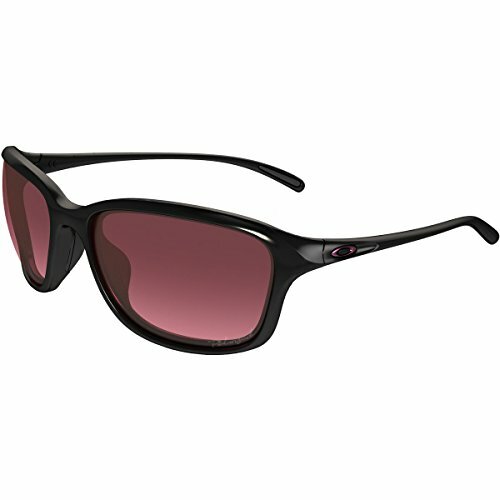 Durability and all-day comfort of lightweight, stress-resistant O Matter frame material. Patented Unobtainium nose and stem pads prevent glasses from slipping out of place. Polarized - Minimized glare via technology that produces the best polarized lenses on the planet (optional). Optimized peripheral vision and side protection of 8 base lens curvature. Optical precision and impact resistance meet or exceed Z80.3 optical and basic impact standards. UV protection of Plutonite lens material that filters out 100% of UVA / UVB / UVC & harmful blue light up to 400nm. Varied field of light transmission (top to bottom) via optional gradient lens shading. Glare reduction and tuned light transmission of Iridium® lens coating (optional). Available with Authentic Oakley Prescription Lenses: Range +2.00 to -3.00 in both SV and PAL.